I am definitely biased, I thought I would say that right at the beginning. 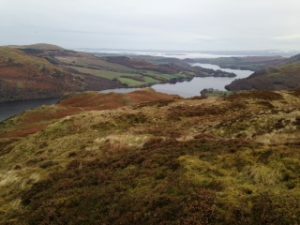 I believe that Ullswater is the most beautiful of all the lakes and I feel very glad that I live close by. What is it about water? Is it a calming influence? Does it make you feel at peace or does it help you feel more content? Sometimes I like to go to the seaside at St Bees or at Silloth and have some fish and chips and a strong cup of tea. There is something about the sea and it’s different to watching the clam of a lake. Watching the water fall at Aira Force is mesmeric. It isn’t the size of the fall or the amount of water but falling water makes you smile. All that said I have some favourite views. I can’t say I have one favourite view and if you ask me again in a few months my opinion might have changed. The seasons play their part in persuading you which is the most beautiful vista. 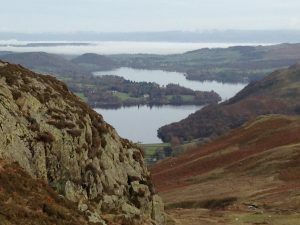 But if you go up in to Martindale and look down over Ullswater you can’t fail to be impressed. At this time of year the atmosphere is obviously autumnal, all the colours are subdued. If you are lucky and look back over your shoulder you might see the red deer in the distance. There can be few places in the world more lovely that this.